This photo was taken in 2017, on the Monday after the 3-day Coachella Fest, where Highway 111 from Palm Springs merges onto the westbound Interstate 10 near Whitewater. 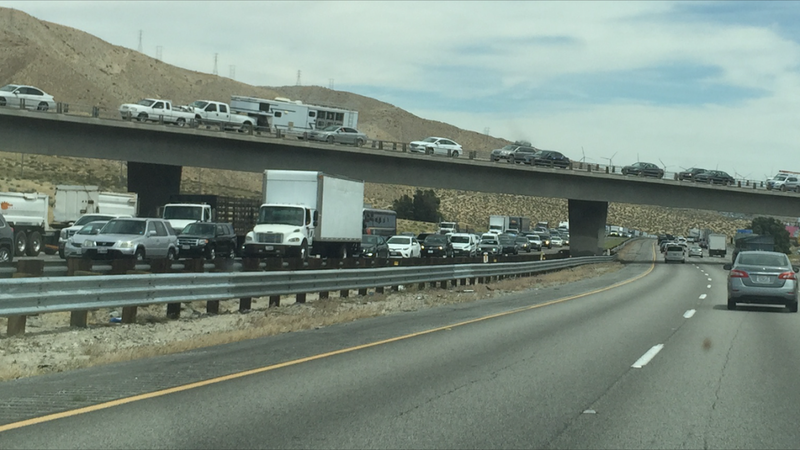 It took some Coachella-weary commuters a couple of hours of brake-tapping to make their way through the jammed freeway traffic between the Coachella Valley and the Inland Empire. Pre-and-post-Coachella traffic this year is expected to be at least as bad as two years ago. city within a city for the start of the Coachella Valley Music & Art Festival. 80s today, the high 80s Saturday and the low 90s Sunday. with performances from Ariana Granda and H.E.R. -- eastbound 10 Freeway exits at Jefferson, Monroe and Washington streets. Avenue, Dr. Carreon Boulevard and Avenue 54.
the 10 Freeway, authorities warned. extra congested through the festival's run. Sunday will be the most congested for those heading west. wait to travel the day after the peak travel day,'' Kasinga said. hotels in Palm Springs, Palm Desert, Indian Wells and other local resorts. Starting next year, people will be able to take special Amtrak trains from Los Angeles to the Coachella and Stagecoach music festivals in Indio. More from KVCR's Ken Vincent. With the Coachella Music & Arts Festival less than two months away, two transgender siblings claim festival staff wouldn't let them use bathrooms reflecting their gender identities last year. KVCR's Danielle Fox reports the ACLU of Southern California is threatening legal action if festival organizers do not improve their bathroom policy. Organizers of the 2019 Coachella Valley Music and Arts Festival announced that Childish Gambino, Ariana Grande, and Tame Impala will headline Coachella's two 3-day weekend musical lineup this spring. More from KVCR's Ken Vincent.